Kenya joined the rest of the world yesterday to commemorate the World Day to raise awareness on desertification that poses grave danger to humanity, fauna and flora globally. There is probably no greater issue than land in the post-2015 Sustainable Development Goals that touches everyone. From the food we eat, to the clothes we wear and the houses we live – it all stems from land resources. In order to “leave no one behind” as proclaimed in the new Sustainable Development Goals, achieving land degradation neutrality needs to be in the forefront to meet our requirements and develop sustainability. The Ministry of Water and Irrigation attaches great value to our biodiversity protection for our sustainable exploitation without endangering our environment. The inclusivity in the understanding of my Ministry means combined efforts by all ministries and agencies that deal with water and water-related activities and every mwananchi to protect our land and resources thereupon – Land Degradation Neutrality. The tree and plant cover that binds the soil is removed. It occurs when trees and bushes are stripped away for fuel wood and timber, or to clear land for cultivation. Our livestock animals eat away grasses and erode topsoil with their hooves. Intensive farming depletes the nutrients in the soil. 2.6 billion people depend directly on agriculture, but 52% of the land used for agriculture is moderately or severely affected by soil degradation. Arable land loss estimated at 30 to 35 times the historical rate. Due to drought and desertification each year 12 million hectares are lost (23 hectares/minute! ), where 20 million tons of grain could have been grown. 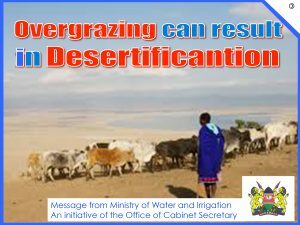 Kenyans must be concerned about the effects of desertification and degradation which are manifesting themselves in some parts of our country in form of grazing and watering points conflicts among pastoral communities and with farming communities. The threats are real and call for urgent resolutions. Maasai women charcoal burners of Mulot in Narok County have quit charcoal selling because, unknown to many, some women have lost their lives in the forests as they cut trees and collect wood to sell to charcoal burners. Today, many of the reformed women have downed their chopping tools to venture into a different income generating dairy activity with a pledge to conserve the trees. That is a commendable conservation measure that will enhance quality of life in Maasailand. • Farmer Managed Natural Regeneration (FMNR), enabling native sprouting tree growth through selective pruning of shrub shoots. The residue from pruned tress can be used to provide mulching for fields thus increasing soil water retention and reducing evaporation. 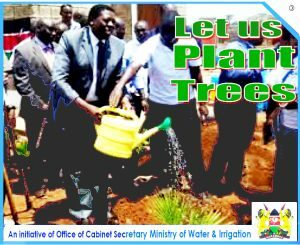 The ministry of Water and Irrigation scheduled desertification awareness events in Machakos, Kajiado and Bungoma. Desertification, land degradation, drought and climate change are interconnected. As a result of land degradation and climate change, the severity and frequency of droughts have been increasing, along with floods and extreme temperatures. More than 50 per cent of agricultural land is moderately or severely degraded, with 12 million hectares lost to production each year. The livelihoods and well-being of hundreds of millions of people are at stake. Nearly 800 million people are chronically undernourished as a direct consequence of land degradation, declining soil fertility, unsustainable water use, drought and biodiversity loss. Over the next 25 years, land degradation could reduce global food productivity by as much as 12 per cent, leading to a 30 per cent increase in world food prices. Without a long-term solution, desertification and land degradation will not only affect food supply but lead to increased migration and threaten the stability of many nations and regions. This is why world leaders made land degradation neutrality one of the targets of the Sustainable Development G Goals. That means rehabilitating at least 12 million hectares of degraded land a year. One important approach is sustainable, climate-smart agriculture. This will not only help communities to build resilience to climate change, it will also support mitigation by taking carbon from the atmosphere and putting it back in the soil. The transition to sustainable agriculture will also alleviate poverty and generate employment, especially among the world’s poorest. By 2050, it could create some 200 million jobs across the entire food production system. Our theme for this year’s World Day to Combat Desertification is: “Protect Earth. Restore land. 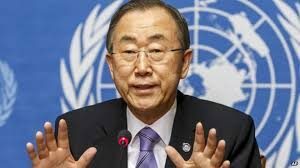 Engage people.” On this Day, I urge cooperation among all actors to help achieve land degradation neutrality as part of a broader effort to achieve the Sustainable Development Goals and build a future of dignity and opportunity for all.